Orsinium (which literally translates to "Orc-Town" in Aldmeris) is the city of the Orsimer and the provincial seat of the region of Wrothgar, which came to be known as the Orsinium Area in the late Third Era. It has been sacked and rebuilt many times over the centuries, as the Orcs are often at odds with their Breton and Redguard neighbors. Orsinium was first built in High Rock, straddling the boundary between western Wrothgar and Rivenspire. In the mid-Second Era, the city was relocated to eastern Wrothgar. In 3E 399, it was relocated again to a site between Wayrest, Menevia, and the Wrothgarian Mountains. By 4E 201, Orsinium had been moved a third time, farther south to an area between Hammerfell and Skyrim. After the transformation of the Orsimer deity known as Trinimac into the Daedric Prince Malacath, the Orcs, who transformed as well, fled to the northern wastes, near Saarthal. After hundreds of orcs, ogres, goblins, gremlins and other beastfolk were set free by the Altmer during the Camoran Dynasty, they chose to settle in an uninhabited mountain region close to Old Hroldan in High Rock, as their people were dependent on a rare, shaggy, giant centipede herd-beast that can only survive at high altitudes. In the tenth century of the First Era, chieftain Torug gro-Igron brought the Orcish people together and founded a village in the western Wrothgarian Mountains. Thanks to the cooperation of several Orcish clans, particularly Igrun, Morkul, Shatul, and Tumnosh, the village quickly grew into a great stone city. The first Orsinium drew the Orcs by its magnificence and Torug's vision of a united Orc nation. It continued to grow and prosper in the First Era, also absorbing the Orc refugees who were fleeing Hammerfell due to the Ra Gada invasion. After a while, the Orsinium army grew determined to capture the Bjoulsae River and force the kingdom of Wayrest to provide compensation for its services. Naturally, this did not settle well with their neighboring kingdoms, especially the Kingdom of Daggerfall. In 1E 948, King Joile of Daggerfall sent a letter to Gaiden Shinji of the Order of Diagna, which proposed a joint attack on Orsinium. 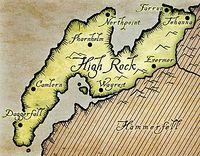 Agreeing to provide aid, an alliance was formed between the Order of Diagna and the armies of Daggerfall (High Rock) and Sentinel (Hammerfell). The armies amassed and began a campaign for the destruction of Orsinium. During the 30-year campaign, which became widely known as the "Siege of Orsinium", the Breton armies of Daggerfall, the Redguard soldiers of Sentinel, and the Yokudan Order of Diagna invaded the Orc homeland. The Orcs gave much resistance and proved themselves to be fearsome and brutal warriors, just as they did in the past. However, King Joile of Daggerfall already planned to betray the Redguards and invade Hammerfell after having destroyed Orsinium. He and his Reachman general, Mercedene of the Winterborn, tricked the Orcish hero Baloth Bloodtusk and his Savage Sons, who initially did not take part in the war, to join King Golkarr of Orsinium. Afterwards, he manipulated the leader of the Order of Diagna, Gaiden Shinji, into having a duel with Bloodtusk over Orsinium's fate. During the duel, Mercedene ordered Joile's archers to kill both combatants, effectively removing the most powerful warriors of both Orsinium and the Order of Diagna for Joile. In 1E 973, with Orsinium's defeat still years away, King Joile launched his invasion of Hammerfell, but he was defeated and killed at the Bangkorai Pass by the Ansei warrior Makela Leki. The Siege of Orsinium finally ended in 1E 980 when the allied forces breached the city's defenses, overran it, and razed it to the ground. Despite this loss, it did not mark the end of either the Orcs or the dream of Orsinium. The city was rebuilt in the same location and razed again at least two more times over the following centuries. 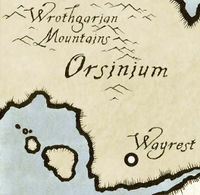 Orsinium was accepted as a territory of the Second Empire during the reign of the Akaviri Potentate Savirien-Chorak. 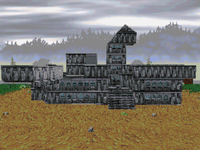 During that brief period, Frostbreak Fortress was built to help defend it. After the assassination of Savirien-Chorak in 2E 430, Orsinium lost its status and protection as an Imperial territory, resulting in another sacking of the city in 2E 431, an assault which was spearheaded by the Bretons of Shornhelm. Not content to simply destroy Orsinium this time, the Bretons also apparently seized control of the land and scattered the Orcs across northern Tamriel. Some Orcs chose to retreat to their strongholds in northern Wrothgar, while others set out to reassert ancient territorial claims in Skyrim. Chief Yashnag gro-Yazgu in particular succeeded in carving out a chiefdom in western Falkreath that persisted until 2E 467, when Yashnag and his champions were slain by Hakkvild Yashnag-Slayer, the Jarl of Falkreath, in a ritual of single-combat. When King Ranser of Shornhelm attacked Wayrest in 2E 566, King Emeric of Wayrest sent emissaries into Wrothgar and promised to return Orsinium to the Orcs in exchange for helping him defeat Ranser. The clan of Kurog gro-Bagrakh answered his call and helped annihilate Ranser's forces at Markwasten Moor. These events culminated in the formation of the second Daggerfall Covenant, and Orsinium, now ruled by King Kurog, became a part of it. Fully aware of the long history of animosity the Bretons and Redguards had harbored against the Orcs, however, Kurog ensured that the terms of the alliance forbade any army from High Rock or Hammerfell from entering Wrothgar under any circumstances. 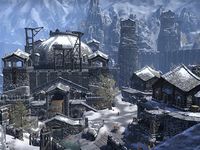 Kurog chose to rebuild the city in another location: in the mountains of eastern Wrothgar, near the border with Skyrim. 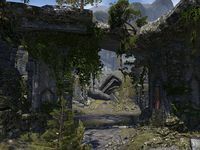 The abandoned ruins of the first Orsinium site became known as Old Orsinium. In 2E 583, he sent invitations to the mightiest warriors of Tamriel to come and help him build the united Orc nation. One of the warriors who came was the Soulless One, who helped Kurog drive the last of the Winterborn out of Wrothgar. However, Kurog, angered by the constant discord between the clan chiefs, and manipulated by his mother Alga, reached for desperate measures. He orchestrated an attack of Malacath cultists on the temple of Trinimac in his city, and pinned the blame on Bazrag gro-Fharun, chief of a Malacath-worshipping clan and Kurog's political opponent. Simultaneously, he commanded Vosh Rakh, a brutal and violent cult of Trinimac who were led by his mother Alga, to attack Fharun Stronghold and tried to imprison Bazrag. He also made the Soulless One convince the chiefs of Morkul, Shatul and Tumnosh clans to attend his moot, where he planned to murder them. The Soulless One eventually learned about Kurog's treachery and sided with Bazrag against the Orc king. Together, they rescued some of the chiefs at the moot and killed Kurog and Alga. Afterwards, Bazrag was crowned the new king of Orsinium. He promised to continue working on Kurog's vision of a united Orsimer people equal to the other races, while also trying to retain peace and not force this vision on anyone. Since Orsinium's membership in the Daggerfall Covenant was based solely on the agreement between Kurog and High King Emeric, the kingdom nominally left the Covenant with the passing of Kurog. It is unknown if Bazrag renewed the agreement. At some point later, the Orcs again lost control of Orsinium. The land was then won back by the Orc hero Gortwog gro-Nagorm in 3E 399, who was disputing claim on the land, made by the Breton noble Lord Bowyn. Gortwog won the land by defeating Lord Bowyn in a duel. The city was rebuilt on a mountainside between Menevia and Wayrest, at the site of Torug's original Orsinium. As the city harbored statues of Orc heroes such as Mauloch and Torug, and was built of iron, it was likely that Nova Orsinium would provoke the same reaction from its neighboring kingdoms as the first city did. However, the land prospered, as Gortwog proved to be a diplomatic as well as a political genius. Following the events of the Miracle of Peace, Gortwog used the Numidium to conquer substantial territory of central High Rock. Its application for elevation to Provincial status, which was proposed to Tiber Septim at the founding of the Third Empire, was finally beginning to be reviewed by Emperor Uriel Septim VII. Orsinium's alliance with its former foe Wayrest gave promise for a stable future and a lasting government. Gortwog sent out many adventurers to explore the dungeons of Tamriel in search of treasure, to prove the wealth of the Orcs. In the early Fourth Era, following the Oblivion Crisis and the destabilization of the Third Empire, Orsinium was once again sacked by the combined forces of Hammerfell and High Rock, and many Orc refugees fled east into Skyrim. The kingdom eventually reformed at a new location between Skyrim and Hammerfell. For game-specific information, see the Daggerfall articles on Orsinium and the Orsinium Area. This page was last modified on 16 April 2019, at 16:09.